Setting up crossband repeating is pretty straightforward with this radio. In this version I use a TM-D710A with the Greenlight labs GPS module to set up crossband repeating and test it with my TYT-UVF1 handheld. There are a few little things that are not obvious in previous instructions I found on the internet, so here is my attempt to explain it. This entry was posted in Uncategorized and tagged amateur radio, crossband, kenwood, tm-d710 on January 21, 2015 by Billy Hyatt. Today, I was bored and decided (and it was suggested to me) to try to get a JT65 QSO via Remotehamradio.com. I was able to get this done and was able to log Italy tonight with it! It shouldn’t take too long to do this for anybody else. This was using the $99/year + station fees subscription (RemoteDX) there at RHR. This will get you the cables setup the way I had them working. The main difference is Cable #2 has MIC AND Line selected instead of just Line. 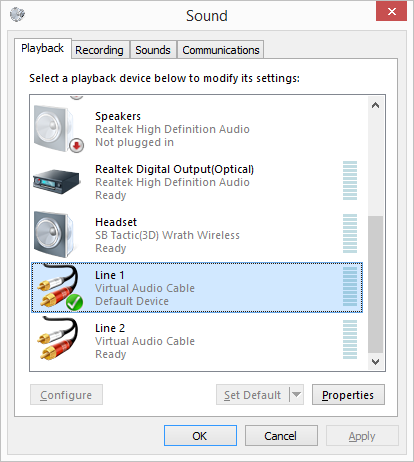 Next, goto the playback devices in your OS (right click speaker in task bar and do Playback Devices on windows 8). You will want to set Line 1 as your Default Device. 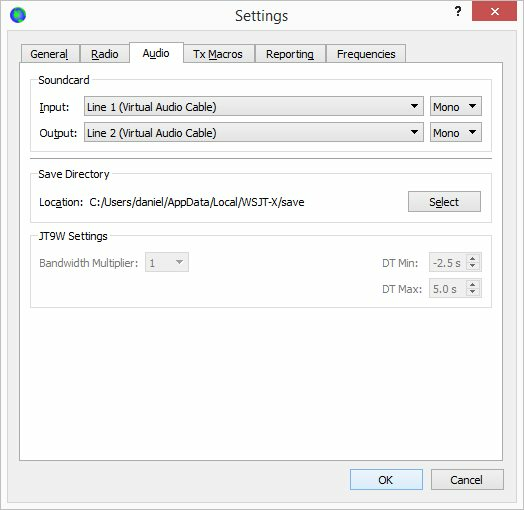 Also, make sure you have all windows sounds off, and do not have any other applications that will do sound enabled. This isn’t such a bad thing, as Line 1 is going INTO your JT65 application, not being sent out to the radio, so it will just mess up decodes if you dont. Next, startup WSJT-X, and go into settings. Add your callsign if needed, and change the grid square to the radio site’s grid. This is to make sure everyone is seeing you as coming from the remote site’s location and not your home QTH. 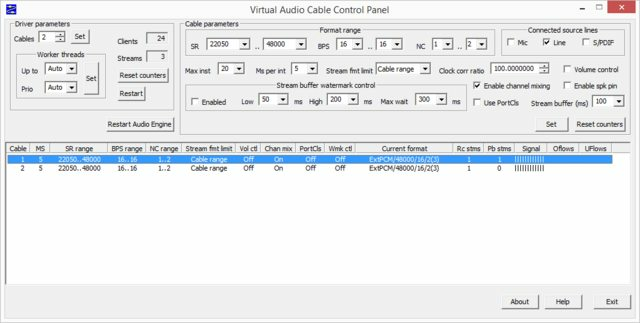 Radio should be set to NONE (you can’t remote control RemoteDX at this point), then go into Audio. Set Input to Line 1, and Output to Line 2. When you hit OK, you should not get any errors. If you do, I am not sure what caused this. I had to change the windows default device back to normal then do these, then windows default playback device back to Line 1. Your mileage may change. This will require you to restart chrome after you do that change. Once you do, you can test again and see if it is picking up the Tune tone from WSJT-X. 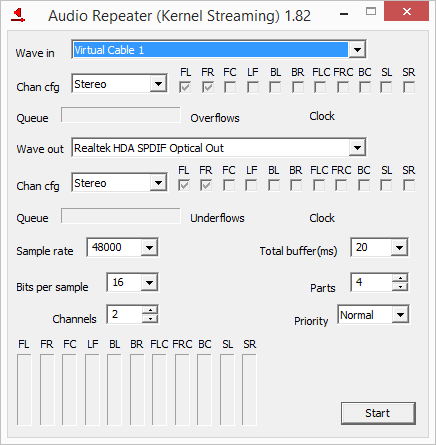 Just select the virtual cable as Wave In, and your normally default output device on Wave Out. Then push start. This will let you troubleshoot the setup without changing things around much. I then got onto a station, set the frequency to the correct frequency for the band I wanted to use, and let it decode a few minutes worth of audio. It should be pretty obvious if it is working or not in the waterfall. The waterfall wont look like a normal waterfall, it will probably have tiny horizontal lines on it. That will be fine. It should start decoding after your first full cycle. To transmit, you will have to hold down the Push To Talk button on the web panel at about :58 seconds to let the latency catch up. 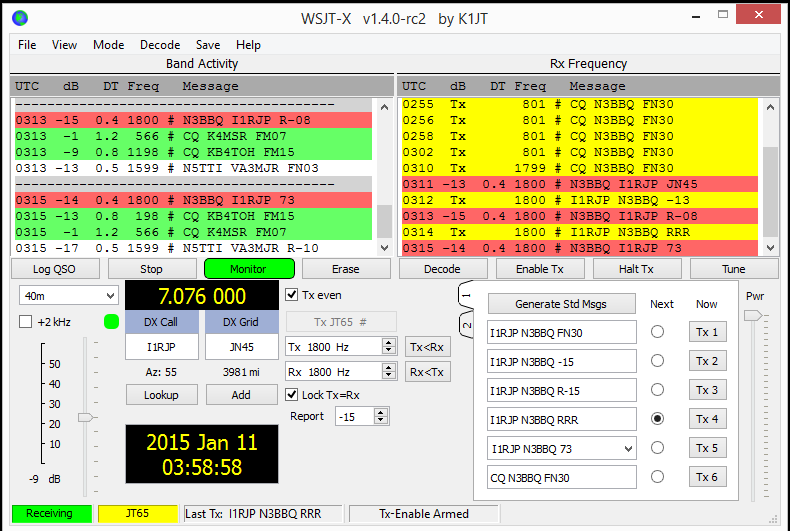 When WSJT-X shows me that it has stopped transmitting, I let go of the PTT. Currently it isn’t as hands off as a local radio with CAT control, but who knows what the future could hold? This entry was posted in Uncategorized on January 11, 2015 by N3BBQ.